2014 August 25: M82. The galaxy is now visible close to lower transit in the north during the few minutes of dark in late August. This image is from a high-resolution sample showing stars to magnitude 16.5. There is no indication of the Nova seen earlier this year. Owing to this lower altitude (39°), exposures longer than 45 seconds at these settings give “fogged” images caused by sky, background illumination. 2014 August 05, observations of M82. The first opportunity for serious night time observing since this year’s summer solstice occurred on the night of Agust 05/06. Despite strong twilight, it was possible to image galaxy M82 and to confirm that the nova observed during the earlier months of 2014 has now faded beyond the range of our instrumentation under current conditions. 2014 April 27, 23h 08m UT. 150mm f5 achromat. A 13.9sec. exposure D800 SLR ISO 2600. Poor seeing, moderate to good transparency. The 150mm f/5 gave the best results over the slower (but superior optically) 200mm f/8 R.C. and 132mm f/7 apochromatic instruments. 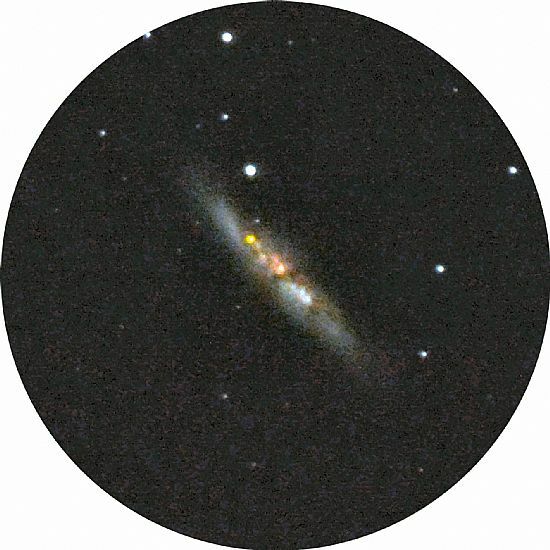 2014 April 21, observations of supernova in M82. 2014 April 21, 22h 36m UT. Ritchey Chretien reflector200mm f/8, D800 ISO 2500. Exp. 31.2 sec. Poor seeing, moderate to good transparency. Out of 10 exposures only two were serviceable. 2014 April 14, observations of supernova in M82. The results show that valuable work may be done on fainter, extended objects even with a “full-moon” present. In this case, M82 was in high altitude compared to the Moon. Note: the colour for M82 has been compromised by high sky background light. 2014 April 10: Recent observations of M82. Not at all easy with this instrument since the subject was in high altitude (75° 50') thus bringing the camera close to the ground! Moreover, with a Moon at phase 81.5% in Leo, one was limited to relatively short exposures owing to sky background light. Added to this, there was a gusty wind with sky clouding over at times and fine rain falling from time to time! The choice of instrument was based upon the need to observe the two planets Mars & Jupiter, with the Moon “thrown in” for good measure (pleasure?). 2014 March 26: Late evening observations of M82. 2014 March 26: Early morning observations of M82. An early morning observation in quiet conditions (curlews and snipe adding to the audible background magnificently) with astronomical twilight well advanced and artificial Earth satellites (not welcome) drifting past in gay abandon! Good transparency and seeing. 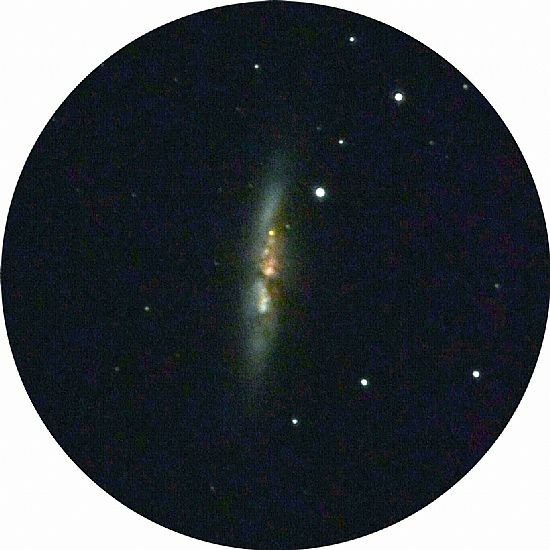 2014 March 20: Obervations of M82. Supernova (SN 2014J) in Galaxy M82. The first observation since March 07, bad weather ruling out nighttime work. A sky of reasonable transparency, short lived with cloud driven on a force 8 gale from the south contributing to poor seeing and some instrument shake and thereby limiting the exposure times to below 30 seconds. The Nova is still plainly visible having faded a little since the previous observation. The nebula was close to maximum altitude at time of observation (79° 43'); transit 22h 11.1m UT. 2014 March 07: Obervations of M82. A brief lull between 20h and 21h 46m UT in very stormy weather. The period in daylight from 10h to 16h produced westerly gales peaking a little above force 11 at times with hail and sleet making it impossible to walk into the wind in exposed areas. Fortunately the observing site at Springfield is well protected from westerly winds by the island’s central hill massif. 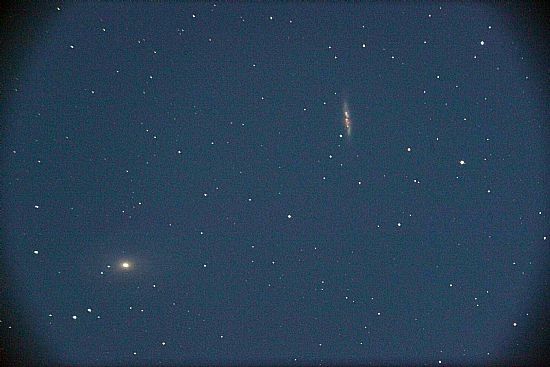 Good results were obtained on M82 using the 150mm f/5 achromat and D800 SLR, despite the presence of a Moon (phase 43.8% ). 2014 March 04: Observations of M82. An early, still night of good transparency and good seeing. Moon phase 15.6%, set 22h 39m.A series of observations of the supernova in M82 were made with the 150mm aperture f/5 achromat. D800 SLR ISO 2000. Exposure times from 25sec. to 70sec. Three images are given all cropped from the originals. Observations would indicate that the magnitude of the nova has dropped to around 12 magnitude. It is of course difficult to make comparisons, even with a good selection of stars in the larger fields of comparable brightness simply because the nova is submerged within the gases of the galaxy. 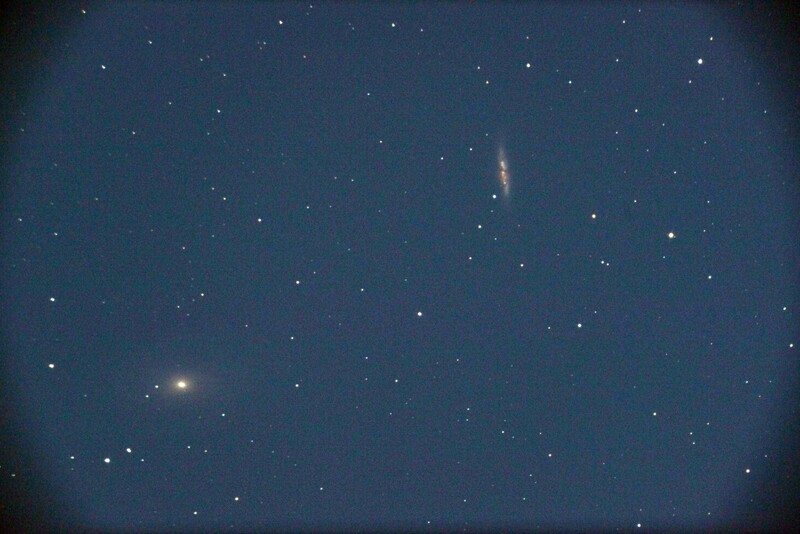 M82 imaged 2014 March 04 at 20h 08m UT. A 54.7sec. exposure D800 SLR ISO 2000. M82 imaged 2014 March 04 at 20h 01m UT. A 40.5sec. exposure D800 SLR ISO 2000. 2014 March 01: Observations of M82. An early, still night of exceptional transparency (stars in zenith to magnitude 6.5 visible to the unaided eye) and good seeing. A series of observations of the supernova in M82 were made with a 180mm f/15 Maksutov-Cassegrain and 200mm f/8 Ritchey Chretien reflector. Exposures with the latter of 150 seconds showed considerable elongation of images due to defects in equatorial alignment of the mounting. Much better results were obtained with the Ritchey Chretien with exposures up to 45 seconds. Observations would indicate that the magnitude of the nova has remain fairly stable for past three weeks at around 11.5. 2014 March 01, 20h 31m UT, exp. 25.3 sec. 200mm f/8 Ritchey Chretien. D800 SLR ISO 2000. 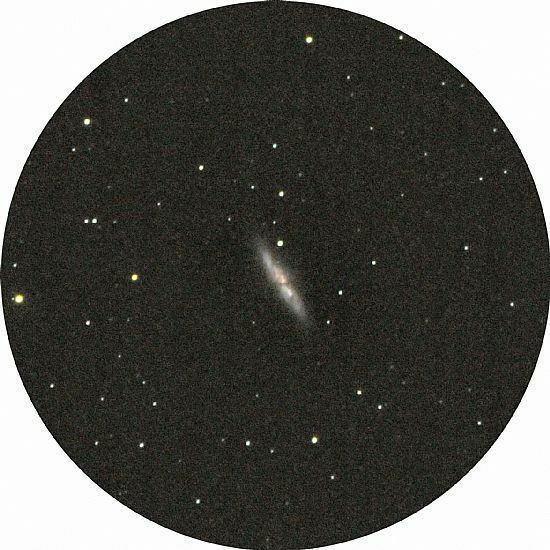 Apparent Dec: +69° 36' 48"
M82 has an integrated magnitude of 8.6 and M81 7.0. They can been seen with a modest 100mm refractor. Moreover, the present magnitude of the nova is well within the range of such an instrument. A location diagram is given on the NOVAE page with the galaxies at the centre of the white circle. The sky is shown looking due north at 19h 00m UT on February 04.